in which I get artsy. So, in my dream life I take really good pictures. A street sign strikes me just so. I see inspiration wherever I look. I quickly grab my camera, adjust to the perfect settings for the light and snap away. The picture is beautiful. Stunning even. Stunning in a way that you didn’t know baby socks or swiffer pads could be. That’s how good I am. In reality, I take 13 pictures of a strawberry from various angles with various settings. Half of them are immediately discarded due to blurriness. 3 of them are unrecognizable red blobs. 2 just look shiny. I spend 15 minutes staring at the remaining pictures and trying to figure out what went wrong and why it looks like a rose petal and not a strawberry. One picture is visually stunning in a way that you will never again under appreciate the beauty in a single strawberry merely passable. 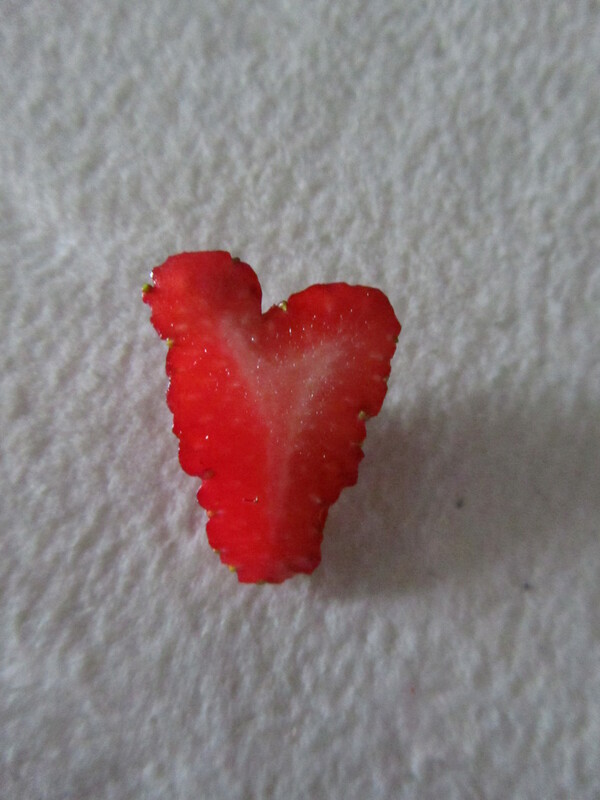 Longer story shorter: I sliced a strawberry. It looked like a heart. I liked that. I took a multitude of pictures. Then I ate it. The end.